Pre Draft Report: Walding is a toolsy athlete with good size who played shortstop and was also his high school quaterback. Scouts did not get a ton of looks in the spring due to an injury but there is a lot to like. He has a good left handed swing which doesn’t show a ton of power yet but scouts expect there to be some there as he matures. Scouts don’t expect him to stick at shortstop because his fringy speed doesn’t allow him to have a ton of range, but he should stick in the infield at third base. He is committed to Oregon and will not be an easy sign. 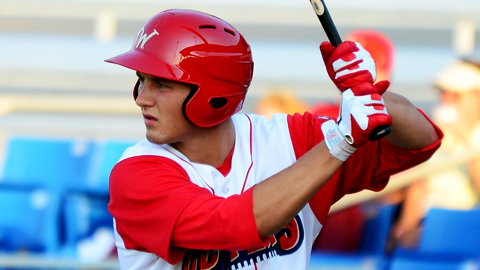 Career Synopsis: Walding was drafted in the fifth round by the Phillies and he signed at the deadline for an above slot bonus. Despite not playing he was ranked #23 in the system by Baseball America and #18 by Baseball Prospectus. Walding was held back in Extended Spring Training before making his debut in Williamsport. Walding hit very well to start the season but struggled for much of the season only posting a .233/.326/.308 line in 284 PAs. Walding did show impressive plate discipline but also a lot of swing and miss. Scouts said that his swing was still impressive and in batting practice he began to show power in his swing. Summary: There is a large gap between Walding’s current tools and his ceiling. He has a great swing that should provide both average and power (he shows power in batting practice but has yet to transition it into games), and he has shown a good approach at the plate with a solid walk rate in his first season. In the field Waldng, a high school shortstop, is still learning to play third base but he has the athleticism and skills to be very good defensively. Upside: Walding still remains a work in progressive but he has incredible upside. His swing his very good and he has shown the ability to drive the ball all over the field and hit for power in batting practice but not in games. Walding is a shortstop still leaning to play third base but he has the hands and glove to be very good there but his throw has a tendency to tail away and cause errors. Walding will move slowly and will likely spend all of 2013 in Lakewood.